In the interests of full disclosure, the authors of this are known to me: I met Amie at a convention some years ago and have kept contact with her (infrequently and mostly electronically) ever since. I was invited to a launch in Melbourne, where I met Jay. I think they’re both great authors and great people, so to the extent that those opinions affected my reading of their book, I declare my bias. I’m going to (do my very best to) keep this spoiler-free, so read ahead freely, whether you’ve read the book or not. Firstly, ‘Illuminae’ is a beautiful book. It is a triumph of type-setting and visual text effects. It is creative and chaotic in a wonderful way, playing with form and experimenting with the construction of each page. It shifts between text-types, one moment you’re reading emails, the next a transcript of an interview, the next a chat log, the next a scientific report. This potentially confusing collision is expertly handled, so that the narrative is formed from each of these things in part and from their interaction and overlap. It’s a method for a modern age, an information age, where a great volume of seemingly disconnected facts are made to coalesce into meaning by their relationship to each other, and the inferences of the reader. The construction of the novel suits its audience. It is clearly and primarily meant for Young Adults, but I am far from young, and I found it engaging and interesting. It does not condescend. The foul language is redacted by black bars (a conceit allowed by the central conceit that this novel is a collected dossier of documents, and that the person for whom it is being collected has asked for the swearing to be censored) but not entirely absent. Like the narrative more generally, it is hinted at on the page but exists really in the mind of the reader. Other than this allowance to the YA audience, this novel would not be out of place on adult shelves. It deals with deep emotion and the ideas it explores have complexity and meaning: the value of love, sacrificing the few for the many, the strength of familial bonds, the human response to tragedy. The narrative itself starts as a fractured romance, two young lovers, separated by circumstance, on a quest perhaps to find one another again and make amends for past mistakes. Or perhaps not. With ‘Illuminae’ there’s the sense that it will be free to pick its own direction, should it wish. The threat or promise of subversion runs through it at every stage. As with the different forms it takes, ‘Illuminae’ has a free approach to genre. Strong Sci-Fi elements complement the Romance and provide a foundation for elements of Horror and Mystery. It is each of these things, at various stages, and none exclusively. The characters are well-drawn, and I found myself invested in both Ezra and Kady, and in them as a couple. It is well-balanced, but ultimately Kady’s story, more than Ezra’s. Of note, the secondary characters are plentiful and support the main cast well. Each is given a sense that they have a story of their own, and a life of their own, beyond the text. They don’t exist merely to serve the protagonists. Details of each life are provided, often to heighten the tragedy of death or to raise the stakes of a conundrum. The author’s drew upon their friends for the many hundred names and identities they needed, but there are also nice little pop cultural references, characters with namesakes from The Wire, or from the author’s favourite bands. These provide Easter eggs which reward the attentive reader. The plot has plenty of twists and turns, meandering at a relatively sedate pace in the early stages before shifting into high gear and delivering a fast-paced, page-turning, late-night, one-more-chapter-Mum, final act. There are questions to be answered, false leads, double-crosses, betrayals, confusion, misunderstandings. Most impressive were the shifting alliances, the way a character could be seen differently by the different protagonists, or the way a seemingly irredeemable character would be given an opportunity to redeem themselves. The form helps here, in that we can head-hop with relative ease and see from multiple perspectives. This is more so the case in the first half, whereas the last half of the book beds us down into a more traditional (albeit nearly omniscient) narrator. 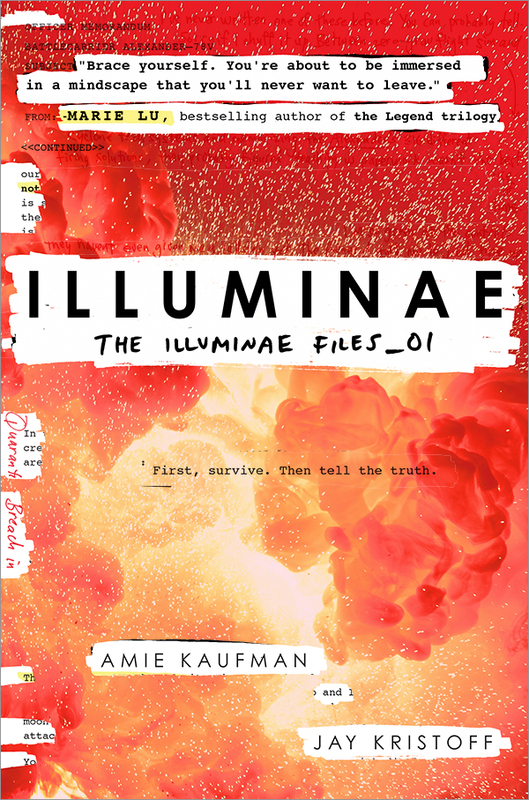 Overall I thoroughly enjoyed ‘Illuminae’, and would recommend it without hesitation. Certainly it’s a great book for the teen in your house or in your life. For anyone with a creative mind, or an interest in narrative craft, it serves as a fascinating exploration of the possibilities of form and alternative modes of storytelling. This entry was posted on Monday, April 25th, 2016 at 2:24 pm	and tagged with Amie Kaufman, Illuminae, Jay Kristoff, Sci-Fi, YA and posted in Reviews. You can follow any responses to this entry through the RSS 2.0 feed. « What ‘The End’ means (to me).